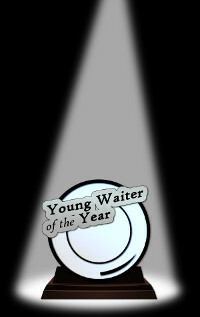 Paul Mayhew, 16, from Halifax is delighted to have reached the national finals of this year's Young Waiter of the Year Competition. The competition, set up six years ago to encourage youngsters to enter the profession, is considered most prestigious within the catering trade. "Paul is a natural," says his trainer, Candice Bulwater. "Being surly and ill-mannered is something that comes very easily to him and, when called for, he can fling some pretty devastating insults. Oh, make no mistake - a gobful of abuse from young Paul certainly strikes home." Ms Bulwater is taking particular care over Paul's 'thumb technique', the delicate art of surreptitiously placing the thumb into a bowl of soup. It is important that only the very tip of the digit is submerged, as any waiter observed to be up to his knuckle in minestrone shows clumsiness and lack of control. Paul is considerably more confident about his spitting technique and he boasts about his ability to hurl phlegm into a pan of mashed potatoes with military precision. His personal best is fifteen feet, but Ms Bulwater believes he can beat this with a favourable wind. If he succeeds it will not only be a triumph for Paul, but also a poignant moment for his trainer. Thirty years ago the young Candice was herself the proud holder of the East Riddings Amateur Gobbing Championship for three years running - before an accident with a runaway stapler destroyed her lips and brought her glittering career to a tragic end.